So, how important are the SATs in the application process to top U.S. universities? It consists of both objective and subjective elements: your transcript (years 9-11 if you’re applying in the 12th grade), high school profile, SAT scores, SAT Subject scores, TOEFL or IELTS scores, application platform (Common Application or the like), essays, recommendations, sample of your research or art if applicable, maybe a resume. It is holistic, meaning that all of the elements of the application package matter. In fact, the whole person – you – matters, not just your grades. 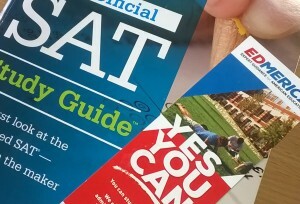 So, will the SATs guarantee your admission? No. Not on their own. But, in an admissions process where the stakes are high and you’re competing for both admission and funding, everything you add to the application plays its role. And SAT success is one of those objective parts of the app that you can, to a high extent, control. It’s up to you to decide when you start preparation, what materials you use, and how you measure your progress. And we can help with all of that. In our experience, standardized test success relies on using the right strategies. And smartly integrate your standardized tests in your successful application. Comprehensive strategy. Stress-free environment conducive to learning. Experiential learning. Interactive teaching. Teamwork. On the big day we want you to walk confidently into the test room and spend the next four hours giving the test your best. You can do it. And EDMERICA can help. Dream big and plan your application accordingly! What makes for a great score and how can you get it? Can you score high in the Math section (even if you’re on a Philology track)? What does it take for a Romanian student to get 800 points (the maximum) on the Evidence-Based Reading and Writing test? How can a high SAT score increase chances of admission to U.S. universities and of attracting financial support? …if you’re in high school – with a focus on those in grades 10 and 11 – or a recent graduate and currently planning your application process to universities abroad. U.S. schools typically require the SATs for admissions, but some schools in Europe also value SAT Subject scores. The practical nature of the program makes it helpful to both first-timers and to those already familiar with the SATs. SCHEDULE: 11.00-17.30 (but depending on the day’s activities, be prepared for an extra 15-30 minutes with us). WHERE: the pretty EDMERICA office in 8 Coltei St., 2nd floor, Bucharest. HOW: intensive training with interactive presentations, teamwork, experiential learning and more. Expect a lot of hard work in a cheerful environment, with the U.S. you-can-do-it attitude. GROUP SIZE: 5-10 participants; admission on a rolling basis. €200 each, if you register with a friend. The participation fee includes an SAT textbook, study materials, lunch, and snacks. Payment in two installments is available, if you register by June 10. In this case, the first payment will be due June 19, and the second July 6. The final registration deadline is Sunday, July 8. Call +4 031 814 29 23. Registration is first come, first served. Your spot will be confirmed after the first payment. But first, please fill out the registration form.